What evidence do we have that CMB is the result of the Big bang? I got the main picture repeated over and over again about why if there's a Big bang we indeed should see the CMB with this feature. In this question I'm asking something different: what independent evidences do we have that the CMB is really related with what the Universe was 400k years after the Big bang and not just related with what the Universe is now or just related with something else we don't yet know? What are the effective evidences that is the result of the Big bang as it is usually described? If the list is too long I would also appreciate one or two references. The first thing to think about is what exactly we mean by a big bang. A weak version of the big bang hypothesis would simply be the statement that at some time in the past, the universe was extremely hot and dense -- as hot and dense as a nuclear explosion. A stronger statement would be that, at some point in the past, there was a singularity, which is in nontechnical terms a beginning to time itself. We have a variety of evidence that the universe’s existence does not stretch for an unlimited time into the past. One example is that in the present-day universe, stars use up deuterium nuclei, but there are no known processes that could replenish their supply. We therefore expect that the abundance of deuterium in the universe should decrease over time. If the universe had existed for an infinite time, we would expect that all its deuterium would have been lost, and yet we observe that deuterium does exist in stars and in the interstellar medium. We also observe that the universe is expanding. There are singularity theorems such as the Hawking singularity theorem and the Borde-Guth-Vilenkin singularity theorem ( http://arxiv.org/abs/gr-qc/0110012 ) that tell us that, given present conditions, there must be a singularity in the past. These theorems depend on general relativity (GR), which at this point is a well tested, fundamental theory of physics with little viable competition. Although there are competing theories, such as scalar-tensor theories, observations constrain them to make very nearly the same predictions as GR under a broad range of conditions. There is a little bit of wiggle room here because the Hawking singularity theorem requires a type of assumption called an energy condition (specifically, the strong energy condition or the null energy condition), and BGV is more of a model-dependent argument having to do with inflationary spacetimes (which violate an energy condition during the inflationary epoch). An energy condition is basically a description of the behavior of matter, sort of roughly saying that it has positive mass and exerts positive pressure. Dark energy violates the standard energy conditions. So if dark energy is strong enough, you can evade the existence of a big bang singularity. You can get a "big bounce" instead. However, we have three different methods of measuring dark energy (supernovae, CMB, and BAO), and these constrain it to be too weak, by about a factor of two, to produce a big bounce. The figure below shows the cosmological parameters of our universe, after Perlmutter, 1998, arxiv.org/abs/astro-ph/9812133, and Kowalski, 2008, arxiv.org/abs/0804.4142. The three shaded regions represent the 95% confidence regions for the three types of observations. If you take the intersection of the three shaded regions, I think it's pretty clear that we're just nowhere near the region of parameter space that results in a big bounce. There are various other observations that verify predictions of the big bang model. For example, abundances of light elements are roughly in agreement with calculations of big-bang nucleosynthesis (although there are some discrepancies that are not understood). The CMB is observed to be very nearly a perfect blackbody spectrum, which is what is predicted by big bang models. This is hard to explain in models that don't include a big bang. Historically, cosmological expansion was observed, and cosmological models were constructed that fit the expansion. There was competition between the big bang model and steady-state models. The steady-state model began to succumb to contrary evidence when Ryle and coworkers counted radio sources and found that they did not show the statistical behavior predicted by the model. The CMB was the coup the grace, and the big bang model won. When you observe the CMB, you're basically looking up in the sky and directly seeing the big bang. Note that although in historical cosmological models, perfect symmetry was originally assumed in the form of homogeneity and isotropy, to make models easy to calculate with, these are not necessary assumptions. The singularity theorems do not assume any special symmetry. For the Hawking singularity theorem, you just need to have a positive lower bound on the local value of the Hubble constant, and that bound has to hold everywhere in the universe on some spacelike surface. Of course, we can't observe all of the universe, and you could say that our reason for believing in such a global bound is homogeneity. However, the existence of such a bound would be only a very, very weak kind of homogeneity assumption -- much weaker than the kind of symmetry assumptions made in specific models such as ΛCDM. I know this isn't quite what you are asking, but it is important because otherwise the question cannot be answered. I would say this question exhibits a subtle but scientifically important error in the way it is framed. The key way that science works is we devise hypotheses that make specific and often quantitative predictions, and then we go out and test those predictions to the highest accuracy we can. But when the predictions work, we should never say "the predicted phenomenon was the result of our theory", because phenomena do not result from theories, they result from nature. The job of a theory is not to produce a phenomenon, but to explain and predict it. When a theory succeeds, we say it is a good theory. Sometimes we slip a little and say the theory is "correct", but what the scientist means there is simply that it is successful-- that's all we ever get in science, successful theories, not correct ones. We simply fall into the habit of using those terms interchangeably, but it causes fundamental confusion about what science is. So the scientific way to ask the question here is, "what evidence do we have that the Big Bang model is successful in predicting not only the existence of the CMB, but it's quantitative elements to high accuracy?" We do not have evidence that the CMB comes from the Big Bang, it is not possible for an observed phenomenon to come from a theory, theories are ways of understanding and predicting phenomena, not ways of making them happen. But framed properly, the question is easy to answer-- the evidence that the Big Bang theory is the only theory that is successful at predicting the existence and quantitative aspects of the CMB is simply that the existence of the CMB was predicted, before it was observed, by only one theory, and that's the Big Bang. Also, its quantitative elements have been tested to be consistent with the Big Bang theory, with higher and higher accuracy with several generations of more advanced observations. However, not only are observations used to test theories, they are also used to modify and improve theories. This is another reason it is important to realize that theories don't produce observations, if you thought that, you could not understand that theories generally require modification and correction once the observations are done. The Big Bang is no exception, as three key elements that were completely lacking from the original Big Bang theory have now been added: dark matter, dark energy, and the era of inflation. That doesn't happen if you imagine that observations "come from" theories! We make theories to be able to successfully predict observations before we have them, which the Big Bang theory did for the CMB, and to be able to quantitatively understand those observations, which the Big Bang theory does for the CMB. Furthermore, it is the only theory we have that does these things. That's really all that can be said about it. We cannot find evidence that the CMB "comes from" the Big Bang model, that's a category error: the Big Bang model, with whatever modifications it needs to do so, lets us understand the CMB, and no other model does that. Saying the CMB comes from the Big Bang would be like saying the added speed that a bullet has when fired from a moving car "comes from" Galilean relativity. Of course it does not, as there is not Galilean relativity that could make things happen, Galilean relativity is a way of understanding what happens that is never exact and completely breaks down in some limits, and so cannot be the reason that things happen. It is a successful scientific theory if applied appropriately, that is all that may be said without forgetting what separates scientific thinking from almost everything else. Not the answer you're looking for? Browse other questions tagged cosmology experimental-physics space-expansion big-bang cosmic-microwave-background or ask your own question. 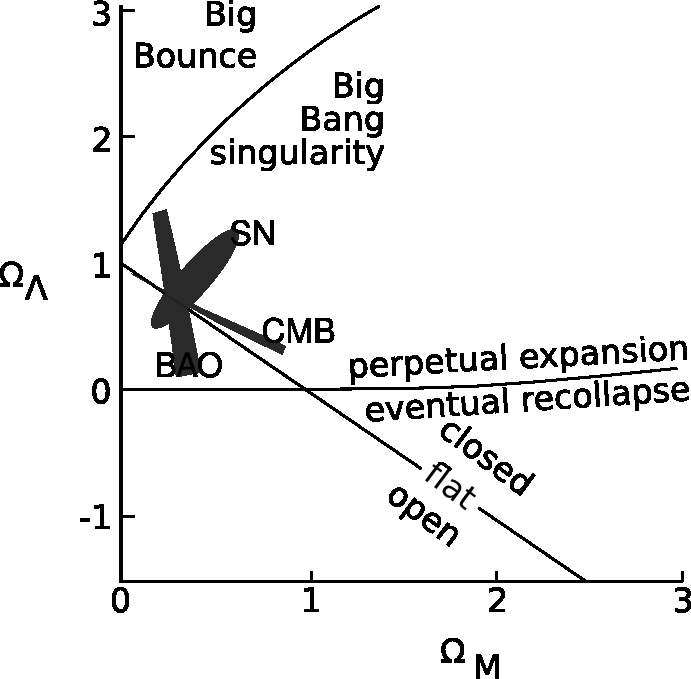 Does Big Bang predict the size of the fluctuations in the CMB? What has been proved about the big bang, and what has not? Why is it said that photon-wavelengths have increased by a factor of 1000 since our universe became transparent to light? What evidence is there that The Big Bang was not just a local phenomenon? Is there a contradiction between isotropy and the Big Bang?